How to explain the foot-dragging of the international community in sanctioning the repression that has rained down on Syria? Answer: The international community has never rushed to denounce repression, wherever it has taken place. It likes the status quo. It hates, as the great French poet Charles Baudelaire put it, movement that shifts the lines. And in principle and tradition, it is scared witless of all that may upset its habits and broad stability in the world. Do we really know of many cases where the international community has flown to the aid of a population massacred, or about to be massacred, by its state? No. So, it’s in the nature of the order of things. What is happening in Syria is a shame, but it’s absolutely in keeping with what is normal. And in explaining our feeble response, our inaction, our cowardice, there is no need whatsoever to imagine who knows what occult interests, shady plots, or machinations. It’s the way of the world. Of course, there is the case of Libya. There is an example, or, to be exact, a counter-example, where the international community has joined forces, has moved, has acted—and the example is that of Libya. Right. But wait! It is, precisely, the exception. It is the absolute exception. And that, moreover, is what makes this Libyan affair so enigmatic and, especially, so precious and so essential. It is the first time in the history of modern and contemporary humanity that anyone has intervened in this way and nipped in the bud the will, expressed by a dictator, to massacre his own people by drowning them in rivers of blood. In Benghazi, we did immediately what it took us three years to do in Bosnia. At the very first moment, we did what we did in Kigali only at the last moment, once the genocide was over. And we did—it’s true—what, for the moment, we have failed to do in Syria. Am I saying one should resign oneself to this state of things? Does this mean that we should rejoice at what is happening in Libya and just write off the dead of Syria? No, of course not. But it does mean that the question should be worded inversely. Not “it’s strange, suspect even, that what we did in Libya has not been done elsewhere,” but “how is it that what we have done nowhere, absolutely nowhere, else, we have done in Libya?” And if we ask this question, here is the answer. A blend of factors is involved, a mixture of chance and necessity with, it must be said, even if one is not in his camp and agrees with him, as I do, on just about nothing else, this unforeseeable element that is, by definition, impossible to generalize: the political will of one man, the President of the French Republic, Nicolas Sarkozy. I come back, then, to the original question. What of Syria? How can we put right our awful failure to act with regard to Syria? Well, by trying to imagine and, perhaps, provoke a configuration such as that which has prevailed in Libya. Libya, I repeat, is not the rule but the exception. It represents the first application of the famous “responsibility to protect” that the theoreticians of the “duty to interfere” have pressed upon the United Nations for the past thirty years and that, after a long ideological battle, was finally adopted. And it is the reason for which the duplication in Syria of what has happened in Libya is by no means whatsoever a foregone conclusion. But let us dream. Yes, I had, I have, a dream. And this dream is that, faced with this Syrian tragedy, there may occur the same type of political configuration as that which no doubt has enabled us to save Libya. And when I say a political configuration, I mean first and foremost another Sarkozy—someone who, like Sarkozy, will dare to break the omerta, smash the law of silence, and see to it that the same kind of miracle that happened in Tripoli will be reproduced in Damascus. As to this other president, my American friends, I don’t see ten possibilities, or three, or even two. I see only one, and that is Barack Obama. The immediate objection will be that we have rolled out the red carpet for Assad for so long, and that it’s difficult to change sides now. People will say, “For years, we have treated him as a responsible and respectable partner, a negotiator of peace, etc.—can we suddenly do an about face?” Answer: It was the same in Libya, the same long and guilty blindness. And the shameful reception of Qaddafi in Paris, in 2007, did not prevent the courageous decision, again in Paris, of 2011! And so, the same causes can produce the same effects. The same strategic turn, one might almost say the same cultural revolution, is possible with Syria. The world has changed bases. The Arab spring has redealt the cards. And nothing forbids a great American president to imagine another alliance and, from there, to implement another political act, the result of which would be to treat Assad as Qaddafi has been treated. Things can happen very quickly. It would be enough, for example, for the president to remember a certain pledge made in Cairo and addressed to the Muslims of the world. It would suffice to recall that America the great, the one that hunts down terrorism, that allows fascism with an Islamist face to get away with nothing and, in the end, can track down Bin Laden and render him incapable of harm, will be truly great only if it grants the aspirations of the peoples of this region for liberty. Treat Assad like a criminal against humanity subject to ad hoc jurisdiction, like a madman who, like Qaddafi, has lost all semblance of the right to govern his country, like a tyrant who draws strength only from our weaknesses and whom it is time to force either to stop the carnage or to step down from power. That is the task before us today. I know there are those who say that it is the commitment in Libya that compels us to adopt a wait-and-see policy on other fronts of these Arab revolutions, hence in Syria in particular. Technically, they are not wrong. And they are even completely right where France and England, who haven’t the means to stand on all fronts and to conduct several wars at the same time, are concerned. But, on the other hand, they are wrong in reproaching the activists of the Libyan action for observing a “deafening silence” regarding Syria and practicing a sort of double standard in this affair. And they are even more in the wrong when they go as far as talking (in France, in any case, and particularly in reference to me) about a trap into which we may have led France, and then her allies, by pleading for this intervention, and when they go as far as to say—yes, yes, it has been said—that the military intervention in Libya protects not only the population of Benghazi, but Bashar al-Assad as well. I would reply, first of all, that I have joined the cause of Libya and am committed body and soul and nearly all the time to this Libyan affair. And I am physically incapable, except with a frivolity of which I am even less capable, of dropping the Libyans to embrace any other cause, devoting to it the same amount of time and energy. There is a second reply. We are confronted here with a situation that necessitates a sort of division of labor. Why cannot others do for Syria what some have done for Libya? Why don’t they go to Deraa as I went to Benghazi? Why don’t they bring back the eye-witness accounts, the stories of survivors, the names of the dead? This is what we have done, with photographer Marc Roussel, in gathering as many images as possible capable of emotionally moving and motivating public opinion. It would be great if others—in Europe, in the United States—took over and accomplished, against Assad, the equivalent of what we have been able to do, and are still doing, against Qaddafi. Denouncing a “deafening silence” is not enough. Breaking it, putting an end to it, filling it with strong and appropriate words, would be infinitely better. A word to the wise is sufficient. And then, a third argument must be added to the above. At this time, the world is confronted with a unique historic sequence, the segments of which—Libyan, Syrian, Bahrainian—are linked and interdependent. Otherwise put, it’s the old domino theory, but in reverse. If Qaddafi wins, order will be re-established in the region in general and, first of all, in Syria, where Assad will be able to jack up the repression that has already left thousands dead and missing (the latter, we know, are often actually dead). On the other hand, if he lets go, if the coalition achieves its goals and the Qaddafi family finally abandons this power it has hung onto for the past 42 years by making the country more or less its own private property, a shock wave, a virtuous contamination, another wind of liberty, another Spring will spread—and Assad, too, will understand that it’s all over. I believe, in other words, in a “Libyan precedent.” I believe that this “Qaddafi case,” if it plays out to the end, will gain widespread acceptance and will be applicable to other dictators of the region. In any event, one thing is sure. There is no cogent reason for “saving Private Assad.” One cannot protect a man who leads his own people as though they were a herd of beasts. It is impossible to entertain the least indulgence when confronted with the photos, those rare photos that reach us from the martyred cities of Syria, ones that show an unarmed population being gunned down by heavy weapons. And, from a strictly geopolitical viewpoint, how can one forget that, ever since his accession to power, this man has harboured, sponsored, and directed, behind the scenes, the neo-fascist organization that is Hamas? It is impossible to say, on the one hand, that Iran constitutes a danger for the world yet, on the other, not to wish wholeheartedly for the downfall of this Iranosaur-in-chief, the military wing of Ahmadinejad in the region, the godfather of the worst terrorists. 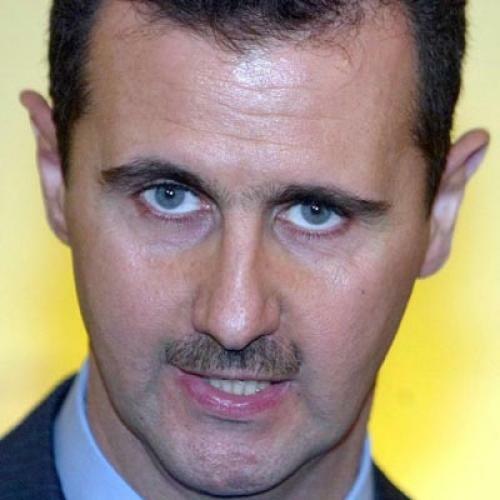 After Qaddafi, Assad—it will be a burning obligation. Bernard-Henri Lévy is the author of Left in Dark Times: A Stand Against the New Barbarism. Translated from French by Janet Lisop.